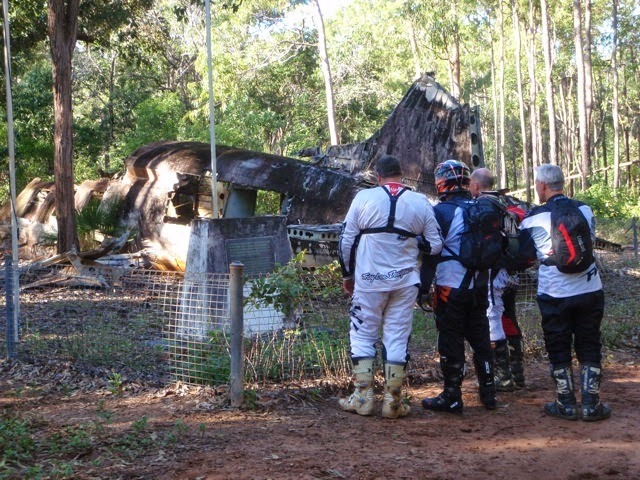 On our last 8 Day Cairns to Cape York Ride we had a group of pilots and aircraft engineers that where keen to check out the DC-3 that had crashed on a flight from Archerfield to Papua New Guinea. 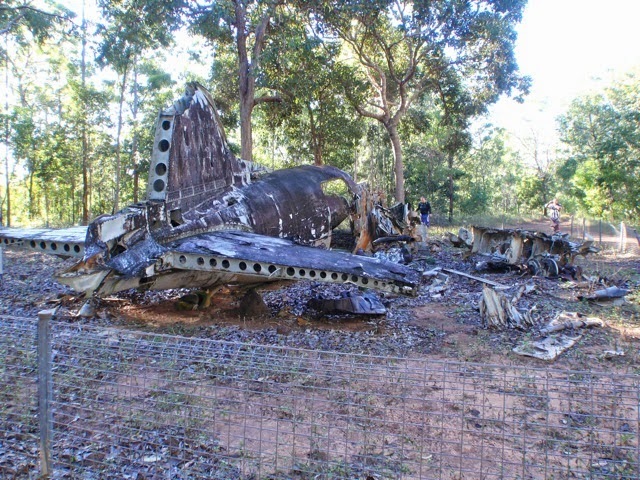 The fuselage of this DC-3 whose service life came to an abrupt halt in +World War II can be found just short of the Bamaga Airport once known as Jacki-Jacki or Higgins field. Early on 5 May 1945, crewed by USAAF pilots and loaded with meat, RAAF DC-3 VH-CXD/4483228 of No 33 Squadron attempted to land at Bamaga in foggy conditions to obtain fuel. However this was not to be, the airplane undershot the approach by about half a mile striking the ground nose first and destroying the cockpit. 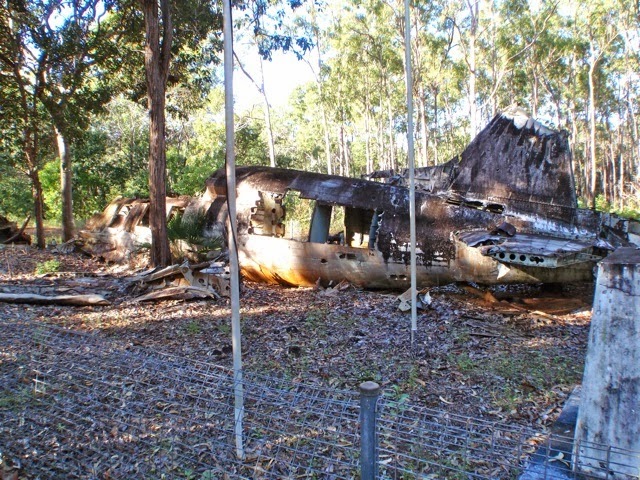 The crew perished as the rest of the aircraft disintegrated. 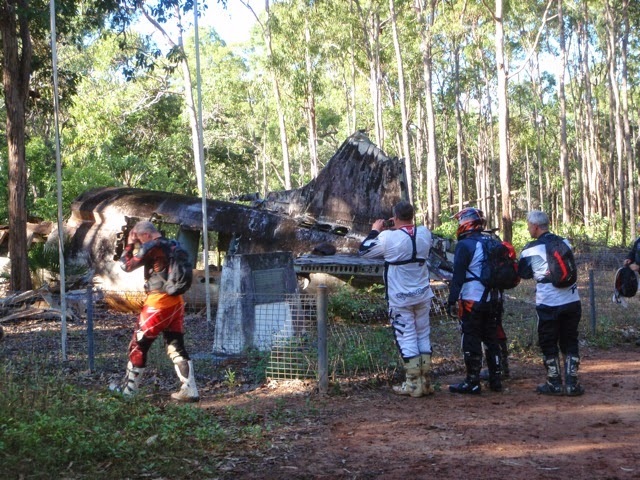 It finally came to rest amongst the eucalyptus trees, its wings being severed. The rear part of the fuselage held together fairly intact with the fin still attached. Operated by ANA as VH-CXD and seconded to the RAAF, the DC-3 c/n 1941 was originally KLM's PH-ALT named 'Toenvalk'. It operated for KLM Netherlands Indies as PK-ALT before coming to Australia when war interupted the later's operation. A plaque has been erected in memory of the crew at the site.